The Zoological Museum in Saint Petersburg is the third largest museum of this kind in the world. It also is one of the oldest museums in Russia: it was founded in 1832 on the base of the Zoological Chamber of the Kunstkammer. The Zoological Museum was opened to the public in 1838, and its' first director was its' founder, F. Brandt. In 1896 the collections of the museum were transmitted to the former south warehouse of the Exchange Stock House, and since 1901 public was allowed to see the exposition there. In 1930 the museum was turned into the Zoological institute of the USSR Academy of Sciences. The exposition of the museum numbers over 30 000 exhibits. It is just a small part of the museum funds that number over 15 million items representing all the groups of animal world — invertebrate, fish, amphibious, reptiles, birds, and mammals. The exhibition is organized in the systematic way. There is a special collection, illustrating Darwin's theory of evolution. Hundreds thousands of typical specimens (so-called etalons) preserved in the museum are of special scientific value. The museum also treasures unique exhibits representing rare animals, listed in the International Red Book, or extinct species. The collections of the Central Asia animals obtained by Przhevalsky and Kozlov are unique, as well as the gatherings of insects, marsupial animals, birds, snakes, corals and mollusks. The exposition of the Zoological Museum also represents exhibits collected during expeditions headed by N. Mikluho-Maklai, I. Kruzenshtern, F. Bellinsgauzen. There are several dioramas where animals are presented in natural environment. For example, dioramas «Numbrays,» «Rookery of Fur Seals,» «Sea Shore Colony of Birds», «Saigas in Summer» and «Komodo Dragon.» One of the most precious exhibits of the museum is Berezovian mammoth. The huge, well preserved ancient beast that had stayed for 40 thousand years in permafrost was found in Siberia on the bank of the River Berezovka. In May 1901 to that place a special expedition was sent. A log house was built over the creature and for two months it was heated to defreeze the mammoth. In Saint Petersburg one of the first to see the mammoth were the members of the Royal family. The unique find was shown to the public only in May 1903 when German specialists had made a special showcase where the mammoth stays till nowadays. 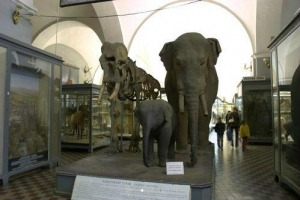 The museum also treasures mummified baby mammoths Dima and Masha, who died 40 thousand years ago. Dima, known to all the scientists of the world as Magadan mammoth, was found at the gold-field on the valley of the stream Kirgilax in 1977. The six-month-old mammoth most probably had strayed and fall into uliginous well-like lake, from which it couldn't get out. The Zoological Museum regularly houses thematic exhibitions and temporary displays of the world museums rarities. Over 800 000 visitors attend the Zoological Museum annually.